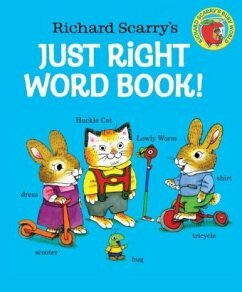 Join Richard Scarry's Busytown friends in this big board book, featuring Huckle Cat and Lowly Worm, as they teach preschoolers new words. From the house to the grocery store, and the harbor to the farm, over 175 clearly labeled objects will have young children immersed in an adventure of discovery like only Richard Scarry could create. Richard Scarry is one of the world's best-loved children's authors EVER! Generations of children all over the world have grown up spending hours poring over his books, filled with all the colorful details of their daily lives. No other illustrator has shown such a lively interest in the words and concepts of early childhood. In his extraordinary career, Richard Scarry illustrated over 150 books, many of which have never been out of print. His books have sold over 100 million copies around the world, and are currently published in over twenty languages. Richard Scarry's son, Huck, carries on his father's work today. Richard Scarry was posthumously awarded a Lifetime Achievement Award from the Society of Illustrators in 2012.